While the US president, Donald Trump, is looking for funds to finance the construction of the controversial wall on the border with Mexico, a US citizen, in just a matter of days, raised a fence in the Mexican state of Yucatan with which he closed the access of a public beach near his home. According to RT, last week on social networks it was reported that in the coastal town of Santa Clara an American citizen that resides in Mexico, had begun to “place beams out in the sea” and completed the construction with mesh, “Which is prohibited, since it contaminates the water,” reported journalist and social activist Rodrigo Vázquez. According to the complaint, the US citizen residing in that Mexican town “has always caused controversy”, and years ago he even placed a drain from his house directly to the sea. The complaint regarding the “wall” on the beach of Santa Clara caused great agitation in the local population, and local residents f Santa Clara have asked the authorities to take action on the matter. The Secretariat of Sustainable Development of Yucatan ordered the person responsible for this work to remove the fence, which was carried out almost immeidately. Meanwhile, the Federal Attorney for Environmental Protection proceeded to impose a sanction against the U.S citizen. 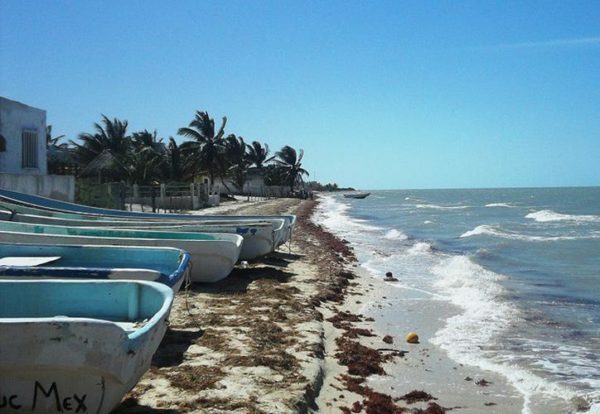 “People need to understand that the beaches of Mexico are public spaces, that can not be privatized,” the Undersecretary of Planning and Tourism Policy of the Mexican Government, Simón Levy, wrote in his Twitter account.